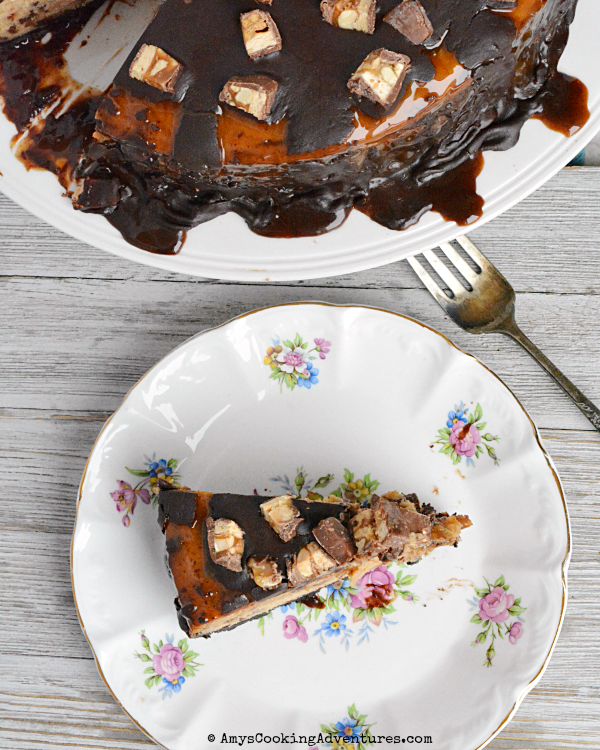 Snickers Cheesecake is rich & decadent and will keep you coming back for more! It’s time for the 2nd annual #FoodBloggerLove. This event is all about sharing the love with our fellow food bloggers! Much like the now defunct Secret Recipe Club, Food Blogger Love is all about getting to know other food bloggers, giving them a shoutout, and introducing them to a new audience! For this event, I was introduced to a new to me blogger, Melody from Elizabeth Jean! Melody is a busy wife and mom of 3 grown boys! 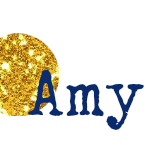 In addition to cooking - with some amazing gluten-free options, she also shares some amazing sewing, embroidery and crafting projects! There are definitely some creative juices flowing over at Elizabeth Jean! There were so many delicious recipes to make on Melody’s blog! I could have cooked an entire day’s worth of recipes from there. I took a close look at her Bacon Asparagus Quiche (click that link and check out how gorgeous it is! Go ahead, I’ll wait!) or Peanut Butter Chocolate Chip Muffins as delicious breakfast options. But it’s the desserts that truly caught my eye! Maybe Dark Chocolate Vanilla Bean Sandwich Cookies? Or Chocolate Trifle? Nope, what ultimately swayed me was a Snickers Cheesecake! You guys. I LOVE Snickers! They are easily my favorite candy bar, so I go nuts with any sort of Snickers variation and this cheesecake has it all! It starts off with an Oreo crust, and is followed up with a chocolate studded peanut butter cheesecake. 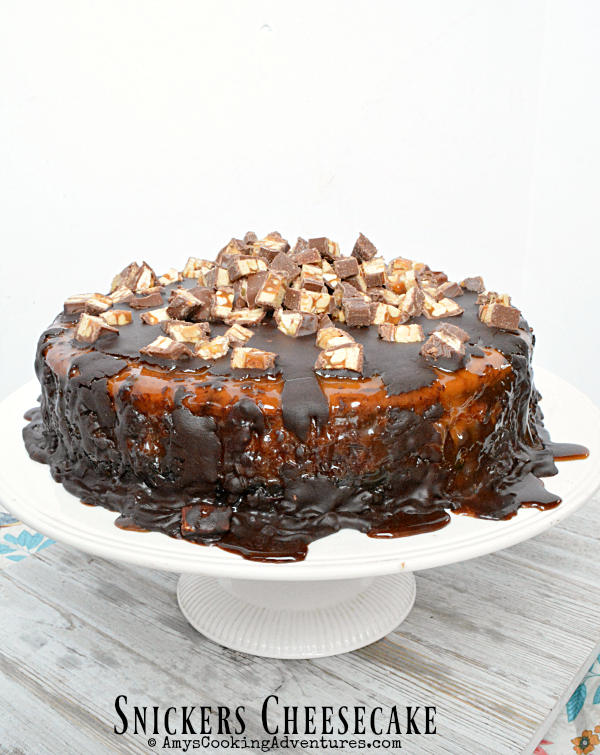 Then it’s smothered with caramel sauce, chocolate ganache, and tons of chopped up Snickers bars! Preheat the oven to 350 degrees F. Line a springform pan with parchment paper and grease lightly. Mix together the crushed Oreos and butter. Press the mixture into the bottom of the prepared pan. Bake in the preheated oven for 10 minutes. Remove the pan from the oven and set aside to cool. Reduce oven temperature to 300 degrees F.
In the bowl of a stand mixer, beat together the cream cheese, peanut butter and honey. Add the eggs and vanilla and mix until combined. Stir in the chocolate chips. Pour the cheesecake mixture over the prepared crust. Bake in the preheated oven for 75 minutes or until the edges are set and the center is slightly jiggly. Turn off the oven. Open the oven, leaving the cheesecake inside to cool for 30 minutes. Remove the cheesecake and cool to room temperature. Refrigerate the cheesecake overnight. Pour the caramel sauce over the cheesecake. Refrigerate for 1 hour. Heat the cream to steaming (in the microwave of double boiler). Stir in the chocolate. Stir until smooth. Cool slightly, then pour over the cheesecake. Sprinkle with chopped snickers. Refrigerate for 1 hour or until ready to serve. Oh, my goodness! Have I told you about my husband's Snicker passion?? I will definitely be making a version of this soon. 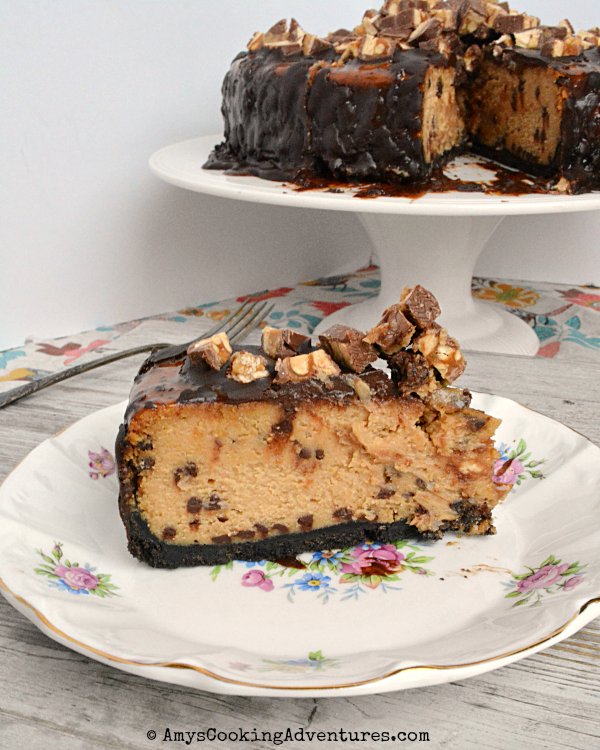 Chocolate studded peanut butter cheesecake.....I swooned when I read that!! OMG! I am awestruck! That looks soooooooo delicious! It's a thing of beauty! Oh man!! this cheesecake...i need to try it asap!! OMG that cheesecake looks absolutely stunning and drool-worthy. Yumm, yumm! !